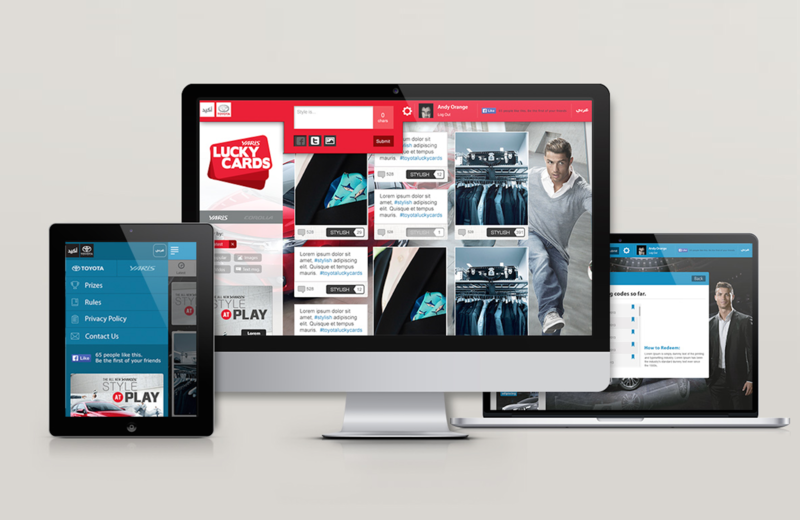 Toyota Lucky Cards was a fully responsive online social competition platform created for Toyota Japan to increase awareness of the all new Yaris Sedan and Corolla in the MENA region. The site was custom built and integrated with other social platforms (Facebook, Twitter & Instagram). Users could participate by posting, tweeting, commenting, and inviting friends to be part of the competition. The more the participant interacted on the site, the higher the probability they would get a lucky card. Every lucky card had a code attached to it that could be redeemed for a prize only by visiting a Toyota showroom. Each country (Bahrain, Qatar, KSA, Lebanon, Dubai and Oman) provided prizes to be won within 30 days including, Smart phones, Tablets, iPods, DVD players and Toyota gift sets. At the end of the competition all winners were entered into a draw to win a grand prize which ranged from a high end TV to a car. – Planned competition mechanic, wireframing and custom CMS. – Sourced development quotes within production budget. – Developed TOV, wrote all copy for website and promotional material. – Project managed site build working directly with development technical lead and designers. – Presented directly to Toyota client. – Trained each Toyota distributor (from 7 different markets) how to manage the CMS and competition platform.